The Lewisham Local History Society was founded in 1961 with the aim of encouraging and assisting study of the local history of the London Borough of Lewisham and nearby areas. The Society enables those who wish to know more about the history of Lewisham and neighbouring districts to share that interest with others of a friendly, like-minded outlook. A full programme of monthly, illustrated local history talks is provided, together with occasional whole and half-day excursions, and conducted evening and weekend walks, to places of historical interest. Society Members receive free copies of the quarterly Newsletter and the annual Lewisham History Journal. This website was launched in 2007 and it is hoped that it will enable the Society to engage with a wider group of people. The website fell into disuse in 2010, due to the permanent departure of the webmistress. By early 2013 it was up and running again, and has remained so ever since. go to "Talks, Walks &c" and click on "Top+Map". Easter Painted Hall ticket offer – Buy One Get One Half Price! Take advantage of their reckless generosity: follow This link and use code easteroffer2019 at the checkout. 31/03/2019: Crossness Pumping Station re-opens! The asbestos is gone, the giant beam-engine is running, and the new Narrow-Gauge railway is nearing completion! See Local Events for details. See Local Events for details of the forthcoming "Medieval Port of London" Conference. Julian Watson will be leading a FREE Tour of St. Mary's Church Lewisham (Ladywell). We meet at 11am in the Church. The recent Newsletter Issue No. 212 (published at the end of October 2018) contained an article by John Kennedy Melling called "Gurney Slade". We now have to report the sad news that Mr. Melling has died. For details, please click on "Local Events". As reflected in the windows of a nearby house. 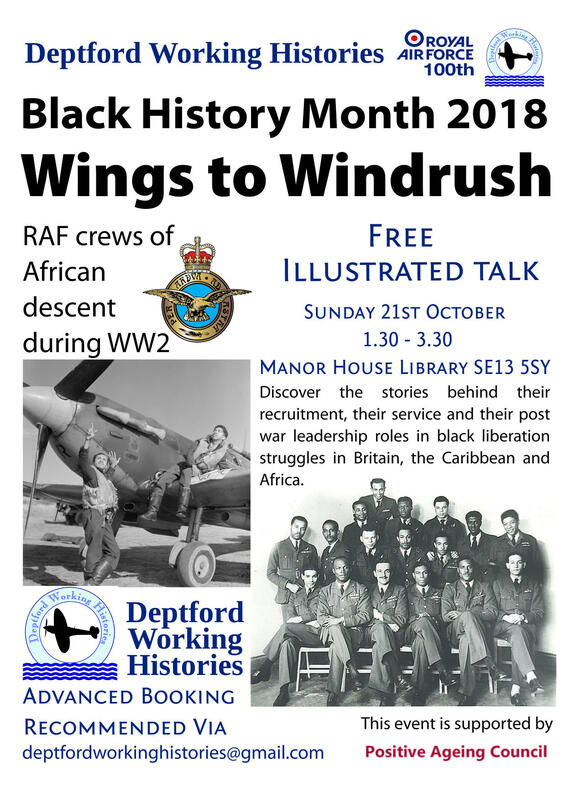 An Event to mark both RAF100 and Black History Month. A FREE illustrated Talk at Manor House Park Library, SE13 5SY, Sunday 21st October at 1:30pm – 3:30pm. Click here for this month's LLHS Talk. Saturday 13th October 2018 is Local London Guiding Day. A day of FREE walking tours led by the highly trained, official tour guides for four of London’s most fascinating areas. A second Visit to the Painted Hall, Old Royal Naval College. We are invited to climb the stairs to near ceiling-height, and view the conservation work in progress at close range. Tour starts at 1:20pm. We meet at the Painted Hall. Monday 30 July to Friday 3 August. See Local Events. Ceremony to mark the restoration of the headstone in Hither Green Cemetery of this well-known local historian. Peter Ranken of the Archibald Corbett Society has been in touch with LLHS to tell us about a film on the life of Archibald Corbett who built the Corbett Estate between 1896-1913 in Catford and Hither Green. LLHS members are invited to the première of the film at St. Andrews Church Hall on Saturday 20th January 2018 at 7pm. The Mayor of Lewisham will be present. Entrance is FREE. For full details, Click here. Julian Watson invites you to the launch of the revised and updated edition of his history of St Mary's Church, Lewisham. It will be held this Sunday 26th November 2017 at 11:30am after the morning service in St Mary's, 346 Lewisham High Street, SE13 6LE. Food and drink will be provided and copies of the book will be on sale. We have recently received news of the death of Gordon Dennington, who was a member of LLHS for many years. He continued to edit the Newsletter until quite recently. He died in Lewisham Hospital on 2 November 2017, after a short illness. The funeral will take place on Tuesday 28th November 2017 at 12:45 at Beckenham Crematorium, Elmers End Road, Beckenham BR3 4TD. It will be followed by a Wake at the Bromley Court Hotel. In early 2016, a Talk was given about the Castle on Shooters Hill. Your Editor recently visited the castle and took some photos, shown here as a Panorama. The view to the North is excellent, extending from the Shard to Canary Wharf and beyond. Click here to view. Maximise the screen, and scroll the picture horizontally using the scroll-bar at the bottom of the screen. Last month's Talk (on Friday 30th June 2017) was given by Dr. Mary Mills on the subject of the Gas Industry in Greenwich. Towards the end of the talk there was a controversy about some of the facts presented. Dr. Mills has been kind enough to provide some notes that will clarify these facts. Click here to read Dr. Mills’ notes. "Lively Minds" at Forest Hill Library this month - see "Talks and Events". See “La Vie Parisienne” at the Bob Hope Theatre! 8th-10th June 2017! See LLHS member John Harrison live, on stage! See “Talks and Events” for an announcement of the Hither Green Festival 2017 which takes place this month. The	Creekside Walk on Friday 21 April 2017 promises to be a popular event. We meet at Deptford Bridge DLR station at 2pm for the walk, ending up at the Creekside Centre at 3.30 for tea and biscuits. Book your place SOON – see "Talks and Events". A visitor to this website pointed out (by email) that the Glue Factory in Ladywell Road was known as "The Neuk Laundry" when he lived in the area (1941-67). This Art Deco (or Faux Deco) building was demolished a few years ago, and has now been rebuilt. Go to 'Gallery' to see some recent photos, or Click here. On 3rd January 2017, a Talk was given at Bromley Local History Society about Amy Johnson, the famous pilot (aviatrix?) of the 1930s. It is noted here because of the many Lewisham Local History Society members who were present. The Talk was excellent, and very well researched, with photographs never seen before. Amy liked being famous but there were times when the strain was more than she was able to cope with. She died in a plane crash at the age of 37. This month's special Christmas Talk is on 16th December. See Talks and Events for details. Prefab Walk in Brockley, Sunday 13th November. “It's Prefab Time again!” – Again! Armed with a well-earned £73,000 Lottery Grant, Elisabeth Blanchet and Jane Hearn are continuing their programme of Prefab Events - they are going national, starting in the Isle of Dogs. A Guided Walk will take place on Friday 23rd September 2016, starting at St. John's Community Centre, Glengall Grove, London E14 3NE (near Crossharbour DLR station), at 12 noon. There will also be a Talk at 1:15pm and a tea party. There is no charge, but you must book a ticket in advance. For details of booking, etc., click on Talks and Events (September 2016). 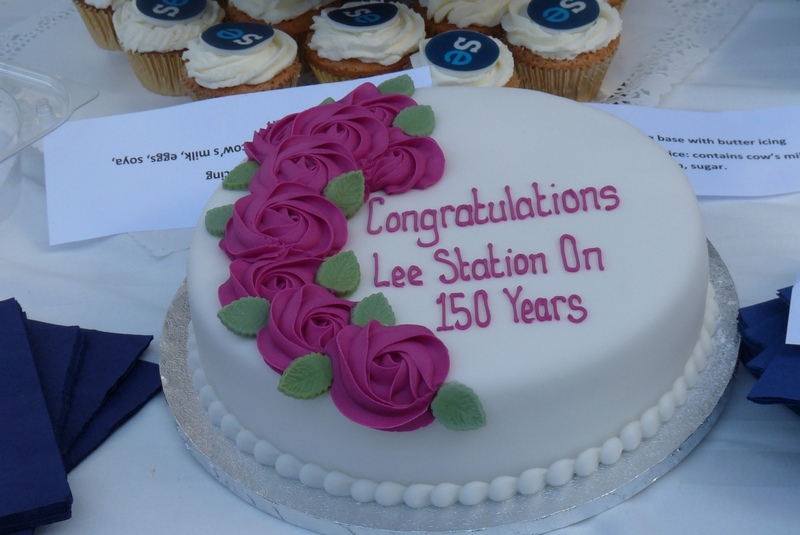 On 1st September 2016, a good crowd gathered at Lee Station at 10am to celebrate the 150th anniversary of the opening of the station in 1866. Mike Gibson of South Eastern Trains officiated, and we were pleased to welcome Heidi Alexander, MP for East Lewisham, as our guest. A special Lee Station Anniversary Cake was provided. Other attendees included representatives of Lee Manor Society and, of course, the Lewisham Local History Society. Click Here for a history of Lee Station. The Greenwich Peninsula Ecology Park Walk. 2016 marks 70 years of prefabs. We are planning a few events to celebrate this unexpected anniversary (prefabs were only supposed to last 10 to 15 years). The first event will be on The Excalibur Estate at St Mark's Church Hall (Baudwin Road, London SE6 1RN), Saturday the 21st of May 2016, from noon to 4pm. The exhibition and tea party are free. There will be a guided walk costing £5 pp (accompanied children go free) starting at 1.30 pm. You can book your place by emailing prefabmuseum@gmail.com. If you wish to bring old prefab photos and documents to share with us, please don't hesitate! We hope to see you on the 21st. More 70-year prefab events all around Britain will be announced soon! On Thursday 31st March, BBC2 will be filming a Victorian market scene in Stratford. We are looking for members of the public, especially those with a tie to historic London, to come down and take part. A Talk at Lewisham Library on 3rd December. See "Talks and Events" for details. This Talk has been postponed until next year. Instead of the Talk, there will be a "Show and Tell" evening. This was a most interesting Talk, describing the speaker's upbringing in the Lewisham area in the 1960s. His Eminence was involved in the setting-up of LLHS. His recollection of this period (1961-1970) is that there were no Newsletters published, and we can confirm this. There may have been other publications, with names like 'Journal' and 'Transactions'. If any member has memories of such publications, or actual copies of them, the Web Editor would be glad to know about them. Free entry. See 'Talks and Events' for more details. At a recent meeting of the Society (31 October 2014) it was announced that there had been a fire at the Prefab Museum, and it would have to close immediately. Investigations into the cause of the fire are continuing, and there is little news about what will happen next. Elisabeth Blanchet, the curator of the Museum, is said to be 'devastated'. She is, of course, not only the Curator but also the creator of the Museum; she has been working on the history of Prefabs for about 12 years, and gave a Talk to the LLHS in January 2014. She has led tours of the Excalibur Estate throughout 2014, during which time over 2,500 people have visited the Museum. Your Editor visited the Museum to see the damage. The prefab is still in one piece but the windows were blackened and there was a smell of burning. it is normally a cheerful place to visit, with flags, bunting and balloons, but these had all gone, and there was nobody there. Very sad. There was much "memorabilia" inside - newspaper cuttings, photographs, trinkets - of considerable value as it took years of work to collect it and put it on display. Click here and also here. Keep December 17th 2014 free! An exhibition at 310 New Cross Road that celebrates objects that we often consider expendable and throw away; plastic bags, posters for local events, notices about 'special offers' in shops. Open 10am-4pm until Monday 23rd June 2014. "The Walk (on Saturday 7th June 2014), joined by 10 members and friends, was a success, despite a shaky start. For a full report, NOW with MORE pictures, Click here. Beryl Gibbs the Society Vice-Chair, during a recent visit to the Prefab Museum, posed the question, "Is the Prefab Museum on the line of the Greenwich Meridian?" Several persons immediately started to fiddle with their Smartphones and came up with answers ranging from "maybe" to "possibly" or even "probably". Your Editor took the engineering approach: a visit to Greenwich Observatory with a GPS device, and a subsequent visit to the Prefab Museum, showed that 17 Meliot Road is pretty well aligned with the stainless steel line in the Observatory that tourists pay £10 to stand on. You can stand on the Excalibur Meridian for nothing! Click here for GPS info. A visit to the Cinema Museum in Kennington on Saturday 12 July 2014 has been arranged. For full details, see "Talks and Events", and scroll down to July 2014. More Prefab events have been announced. The Prefab Museum will remain open until May 31st 2014. There is a Talk and Tea party on Saturday March 31st 2014, with additional Tours in April and May. See “Talks and Events” for times and dates, or Click here. The arrangements for the proposed River Wandle Walk are almost complete. It will take place on Saturday 7th June 2014. For more details, click on "Talks and Events" and scroll down to June 2014. An extra Event has been inserted. “Every Picture Tells a Story” is an exhibition of photographs by the late Chris Schwarz. See the Talks and Events page, March 2014. The recent Tour of the pre-fabs was well attended (about 18 people, including 4 from LLHS), and included a viewing of the inside of several dwellings and a talk about the Estate. Your Editor took some photos and bought an Excalibur pre-fab mug. There will be another tour in Febuary 2014. The Talk about the pre-fabs (January 31 2014) was extremely well attended, despite the foul weather. Ms. Blanchet has travelled widely in the UK, photographing pre-fabs, and there are a surprising number still in use after 70 years, although their intended life was only 10 years. The Winter 2013/4 Newsletter is now available, and contains news of recent events. One event is of great importance to the people of Lewisham - the decision to downgrade some services provided by Lewisham Hospital has been quashed by the High Court. Not yet history - but it will be unless we "watch the Government like a hawk", as the Newsletter Editor puts it. There is a correction to the birth-place of Claude Rains, and a note about the novelist Joyce Cary, who was born locally. Excerpts from a "Mini-Guide" to Deptford describe St. Nicholas Church whose existence dates back to the 12th century. Christopher Marlowe gets a mention, of course. A further excerpt reminds us that the navy's "Victualling Yard" was located in Deptford. Sounds familiar? A Talk on this subject was given to the LLHS, not long ago. To find the details of this, click on "Talks and Events", which is now an Archive of all Talks from 2010 onwards. Instead of searching for the Talk the hard way, press Control-F and a small window will open. Type "victual" (without the quotes) in this window, and you will go directly to the topic. The longer the document, the more time you save by doing it this way. The Autumn 2013 LLHS Newsletter contained news of recent events that the Society organised or has been involved in. Lewisham Peoples Day 2013 took place on Saturday 13 of July in brilliant sunshine, and there were a very large number of visitors. Some of them called at the Society's stall, and your Editor (who took some photos) saw more than one new member being signed up. Thanks are due to Tamsin Bacchus, Beryl Gibbs, and David and Sylvia Eley for organising and manning the stall. A Riverside Walk took place on Sunday 21 July, along the Pool/Ravensbourne river between Catford and Sydenham. It lasted for 2 hours, and your Chairman, who led the walk, gave a summary of his extensive knowledge of the history of the area, which included topics ranging from gravel pits and floods to cricket and barrage balloons. Despite the extremely hot sun, a good time was had by all and a few decent snaps were taken by your Editor. ‘Monsters In Our Midst’, inspired by a recent talk to the Society by Alan Payne, relating to local film actors who played leading roles in Universal Studios ‘monster’ films of the 1930s. ‘Ralph Slater – Famous Stage Hypnotist’. ‘Birley House Open Air School, Forest Hill’, one of the first in the country. ‘Pageantry & Protests On Blackheath’. The Society also looks forward to an expansion of activities in 2014, while stressing the need for volunteers (either members or others who would like to help) to organise visits, walks, etc. Finally, our Website offers a method of publishing at low cost. No typesetting, printing, paper-handling or binding is needed. It doesn't replace the Society's printed publications but it can add to them. If you have been to a Talk and have something to add to what you heard, you can email Gordon Dennington, or us, and we may well publish your comments here. See the 'Contacts' page.